Lepakshi Temple is a historical temple in Ananthapur Dist at Andhra Pradesh. It was built during the period of Vijayanagar kingdom. The actual name is Veerabhadra Temple and since it is located at the village Lepakshi it is also known as Lepakshi temple. This temple is famous for historical, religious, cultural and spiritual significance. It was built in 16th century by two brothers Viranna and Virupanna. 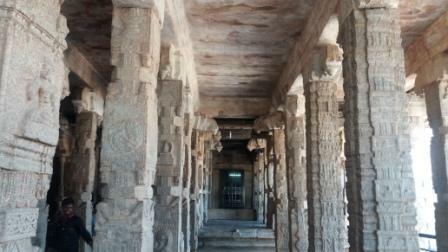 There are about 70 pillars at this Vijayanagar style stone temple. Lepakshi is famous for its hanging pillar which does not rest on the ground fully. 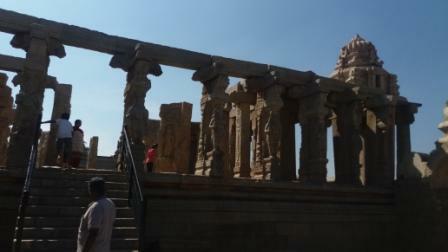 It is the best known and a tribute to the engineering experts of the ancient and medieval temple builders of India. However, it is a bit dislodged from its original position because of an unsuccessful attempt of an engineer during the British period, who had tried to move it to find out the secret of its support. The temples of Papanatheswara, Raghunatha, Srirama, Veerabhadra and Devi Durga are located in the same complex on a hillock named as Kurma Saila (tortoise shaped hill). Before you reach this temple you can see the huge Nandi monolith, about a kilo meter away, which is the largest Nandi monolith in India. The structure is built in 27ft in length and 15ft in height in a single stone. In the temple's outer enclosure, there is a mammoth Ganesha in stone leaning against a rock. A huge Naga can be seen there with three coils and seven hood and it is considered as the largest Nagalinga in India. 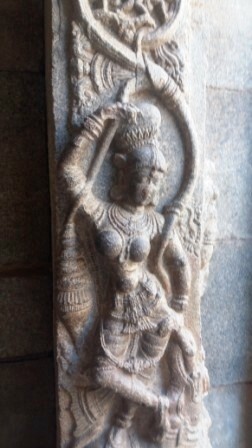 The finest architecture in Dravidian style and paintings depicting stories from mythology, wars, marriage and fascinating tales of the bygone era can be seen on the walls and pillars. There are several eateries on the way. We had breakfast at Udupi Swaad and on our way back we had lunch at Nandi Upachar. Both were quite nice. It is better to visit the temple early in the morning, or in the evening. Otherwise most of the time the place is very hot. If you want to stay there and visit the place Hotel Haritha is the nearest Hotel. From Bangalore, Lepakshi can be visited as a one day trip. If you have time you can visit Nandi Hills on the way. 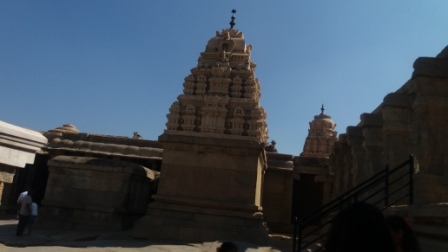 If you are a religious or spiritual person you can visit Puttaparthi which is one hour drive from Lepakshi. Distance from Bangalore is 140 kms only.